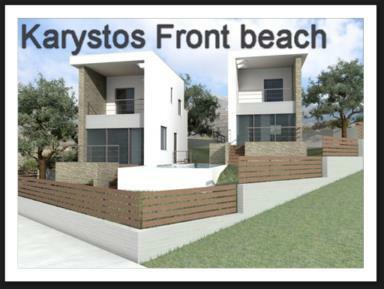 The new project in Karystos consists ONLY of 20 plots , 500 sq. m. each. which is approximately one hour and a half from the Athens airport. From Rafina to Marmari, a port in Evia, 1.30 hrs'. The total time is approx. Marmari to the development appr 30'.2 - 2..30', The journey is very pleasant because the road journey compined with the sea journey interrupts the monotony. Each plot is 500sq.m and all the plots have sea view. Karistos in the distance, which is only 10 minutes drive away. which are on the beach). The roads are made, not ashalted but cemented, which means that they do not require maintenance. A 70sq.m. and 90sq.m. of the older style, to which improvements can be made. You will have the quotation for these soon.